The HIGHLOW project depicts remarkable moments in the lives of young adults who are dealing with homelessness or other difficult circumstances. That’s a young man named Jake describing, in his own words, a low moment in his life. 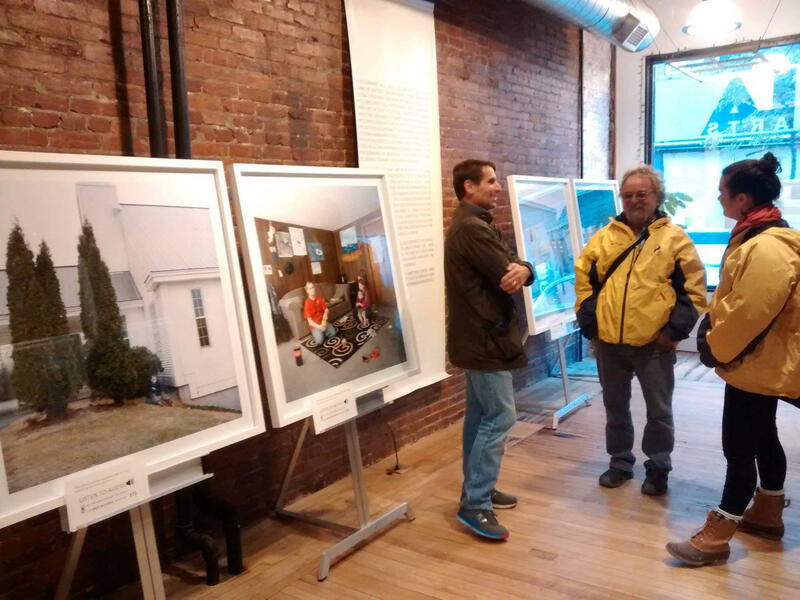 That moment has now been turned into art and exhibited as part of the HIGHLOW project, which has come to Maine. The project is on display at the L/A Arts Gallery in Lewiston in November for National Runaway and Homeless Youth Prevention Month. The project is on display at the L/A Arts Gallery in Lewiston in November for National Runaway and Homeless Youth Prevention Month, and a mural of the work has been installed on an exterior wall of the Lewiston Public Library. The HIGHLOW project depicts remarkable moments in the lives of young adults who are dealing with homelessness or other difficult circumstances. Those moments are recreated in large format photographs, using elaborate reenactments to show a high and a low in each youth’s life. 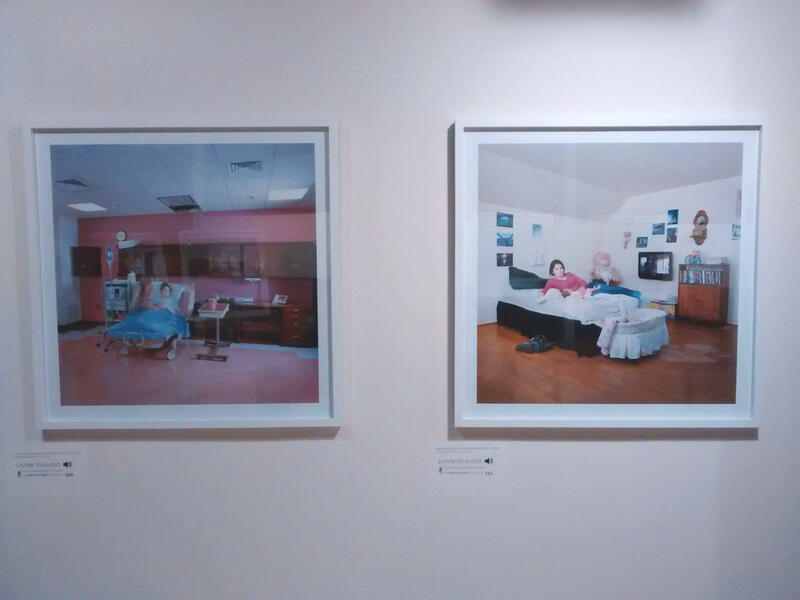 The subjects of the photos also tell their stories in accompanying audio narration. “The idea is to try to understand the experience from the perspective of the person who is having the experience, a radical reordering of the power dynamic that can sometimes happen between the researcher and subject, or documentarian and subject,” says Ned Castle, the artist behind the project. Castle is a Vermont-based photographer and ethnographer with the Vermont Folklife Center. A few years ago, he was hired by the Vermont Coalition of Runaway and Homeless Youth Programs (VCRHYP) to profile their programs. As he spent more time at the centers around the state, he realized that there was an opportunity for a larger project, one that would focus on the young adults and their experiences. Some of the youths had to return to places where they had experienced some of the toughest moments of their lives. The idea of homelessness might conjure images of someone on a busy city street holding a cardboard sign, but it is prevalent throughout the United States, and can take many forms. Nationally, about 1 in 10 minors and young adults face some form of homelessness in a year, including individuals who have run away, been kicked out or are couch surfing. So the seeds of the HIGHLOW project were planted. Castle began working with VCRHYP staff and a group of about two dozen young adults, and they decided that using the format of high and low moments would create a framework for storytelling, while also leaving room for them to share what they wanted to share. Together, Castle and the youths pored over books of photography and brainstormed what high and low moments they wanted to reveal, with some of them sketching out scenes in full before recreating them. Then they put the narration together from interviews Castle did with the subjects. it took a full year, in some cases, to complete the story. The mural is being shown on the side of the library facing Kennedy Park through Nov. 30. In most cases, the photos were taken where the original event actually occurred, using actors to complete scenes when needed. Some of the youths had to return to places where they had experienced some of the toughest moments of their lives. Sharing intimate life experiences can be daunting, and some participants discovered that they weren’t ready to delve into specific low moments, so they chose new ones – or even dropped out of the project altogether, which they were free to do at any point. “One of the keys to this project being successful was that the content of the project was never more important than it felt to be doing it,” Castle says. That sensitivity to participants' wellbeing is one reason the project appealed to Rachel Spencer-Reed, the Director of Development and Community Services at New Beginnings, a center that provides runaway and homeless youth in Maine with housing, health and other services. New Beginnings is one of the sponsors that helped bring the HIGHLOW Project to Maine. 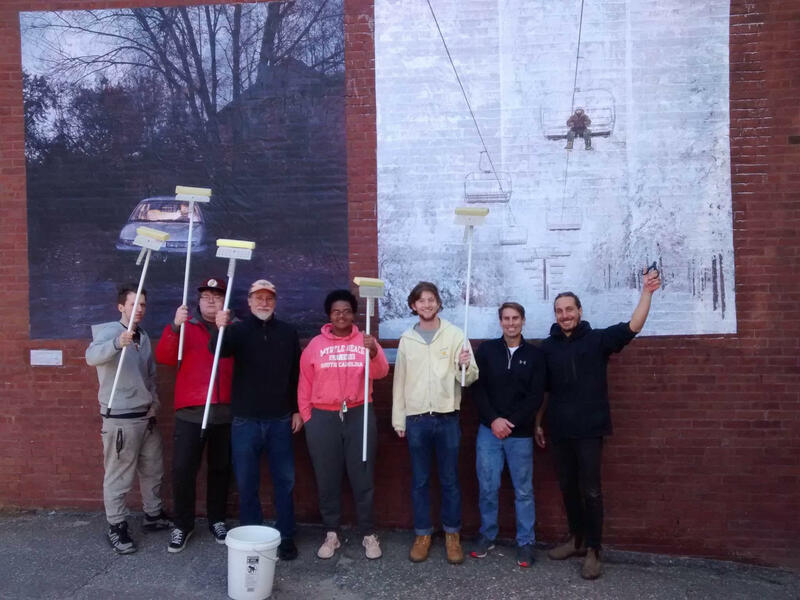 The New Beginnings team worked with Castle (who is on the right) and the Lewiston Public Library to install a mural on the side of the library, to make the project "accessible to people who might not relate to coming in to a gallery space," Castle says. The staff at New Beginnings say they hope that the project can help the community understand what some of these young adults are going through. “We want to make sure our supporters could hear these stories and have a window into some of the stories of the youth we currently work with, without having the youth we currently work with feeling like they are on display,” says Spencer-Reed. So far, the project seems to be effective at doing that. Castle has toured with it throughout Vermont, often with some of the youth, and crowds have had strong reactions. The art can also work as an outreach tool. The New Beginnings team worked with Castle and the Lewiston Public Library to install a mural on the side of the library, to make the project “accessible to people who might not relate to coming in to a gallery space,” Castle says. 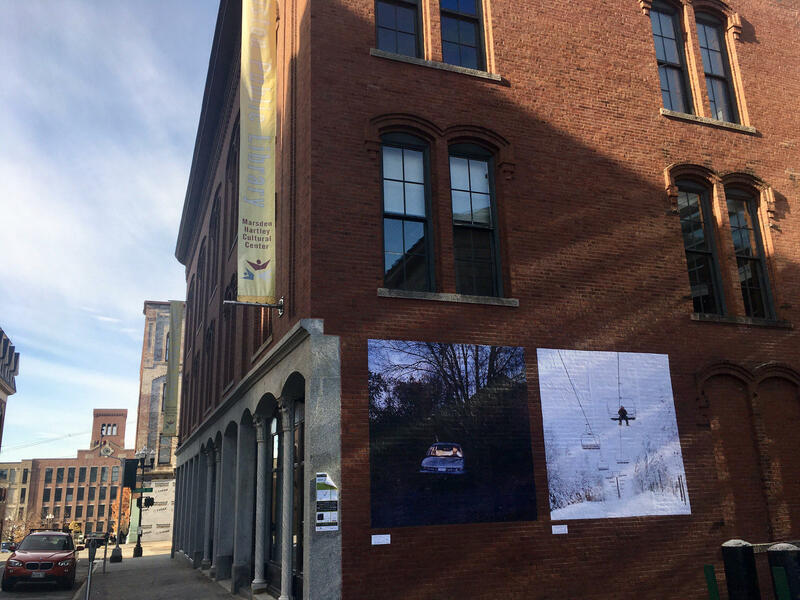 The HIGHLOW project is on display at the L/A Arts gallery in Lewiston, and the mural is being shown on the side of the library facing Kennedy Park through Nov. 30. You can also find pieces from the HIGHLOW project online.